TOM SPURGEON: It seems like you're having fun publishing this one. FRANÇOISE MOULY: Yeah, it's like a publisher's dream, right? You get to publish something that made such an impression on you when you were young. For me this was like my immersion into comics as a medium. It made me aware of it. SPURGEON: You mention your personal experience with these comics in the book's accompanying material. I wonder if you could talk a bit more at length about that personal connection. One thing I thought fascinating is that you say the authorial flourishes were a great part of what appealed to you about this work. The deconstruction impulse that Fred had, for instance... it sounds like you had a sense of both the comic and the man creating it. MOULY: Yes, yes. You say it so well. [laughs] That's exactly what happened. I was a typical French teenager, meaning I didn't have a life. I went to school. I went home. That was about it. There was very little room for leisure. I was probably about 12 years old around that time. It was one of the very few things that was a part of my entertainment package, the fact that there was a comics magazine called Pilote coming out. Neither of my parents were that plugged in, but they read newspapers and magazines. My dad went to the newsstand every day to get his paper. Once a week he would take me to the newsstand and he got me my copy of Pilote. That was really exciting, to have a weekly comics magazine. I would savor it. [laughs] There was reading it and then there was re-reading and making it last. I grew up in a culture where kids owned a lot less stuff in general compared to the amount of stuff I've bought for my children in America. It's a thousand times more than what I ever got as a French kid. I read a lot of books, but I didn't have too many books that I owned. With comics, there were albums that were bound in cardboard and relatively expensive, so we shared them. You'd go over to a friend's house and you'd make sure you'd ask for one of them for Christmas and one for your birthday and you'd coordinate with your friends so you wouldn't ask for the same album. We would all read them. The albums around were like Asterix and Lucky Luke -- that was my favorite. With Pilote, I had to be careful, because I loved the humor stuff and I didn't quite like the adventure things as much. Moebius was doing Blueberry, there was Valérian -- a space-age adventure thing. Those were stories to be continued from week to week. I read them first so then I could get to the stuff I really loved, which was the humor stuff. Anything and everything that Gotlib did I adored. A lot of the humor strips were really wonderful. Pilote was more author-controlled. It wasn't a bunch of editors saying, "Oh, we need a cowboy strip for ages 8 to 12." Pilote was done by the artists themselves, including [René] Goscinny and again Gotlib and a lot of people that were inventing things. Fred, for example, wasn't commissioned by editors that said, "We need some fantasy strips." This was something that he tried for a short strip, and then Goscinny told him, "This is great. Do more." I remember reading somewhere that one of the things that hooked the kids onto it was the fact that he had a talking donkey. And it worked for me, this relationship with his donkey, this talking animal. [laughs] It's not how you would create a property. The stuff in Spirou and a lot of the other kids magazines felt more rote in that way. But Pilote had a lot of new things. There was a boy/girl thing, also. Spirou felt like it was for boys. [laughs] Who else would want to read some of that adventure stuff? By having humor... Pilote was in no way a girl book, but it was more unisex. There wasn't that emphasis on racing cars. It had a couple of adventure strips, but it seemed more open-minded in terms of not trying to dictate to an audience but letting the artists do things that were fun for them to do. It's a lot of work to do a strip every week. It's an insane production schedule. They really did manage to do something that was quite lively. It seeded a lot of the later magazines like L'Echo Des Savanes. Philémon was both humor and adventure/fantasy. That was by far the most -- not just my favorite, but the one I could re-read and get more and more out of it. The humor stuff, I could read and it would make me laugh and I could read it a second and third time, but the Fred stuff I could find more on a fourth and fifth reading. I found more flourishes and details and things that he had done. What I really liked about it was the convincing logic. He was pretty unflappable. [laughs] There were two suns, he was on an island, there was a centaur, but he was not questioning -- clearly this was happening to him. There was the denial of his father that any of this was happening, but there were characters you could trust. He didn't doubt the world he was exploring no matter how fantastic it seemed. The fact that he has fallen on an island that is the letters of "Atlantic Ocean" written on a map, that is a kind of conceptual idea where what is represented on the map is a representation of reality so if there are letters they must be real islands -- that was thought-provoking, and I liked that. The concepts he was exploring, he is forcing the logic of it. In that sense he has a lot to do with Lewis Carroll, who was a mathematician and studied logic. In school, I was studying something called New Math, which is basically that Euclidian math is based on the fact that two parallel lines do not meet, but you can derive a whole other set of mathematical rules from "Let's say two parallel lines do meet," which means you have a completely different system. That doesn't work with common sense; the way we perceive the world is actually very useful. When you talk about parallel universes and more than three or four dimensions, all of this was shown in my comics! With Fred, the power of imagination and a certain kind of intelligence -- it was both arbitrary and very systematic. So enchanting, the way the character when you were reading it, it's not ironic; it's a very sincere exploration of the world of imagination. I watched YouTube video interviews with Fred where he talked about the source of his storytelling. He's from a Greek family, Greek immigrants settling in Paris. His Mom grew up in London; her family was Greek immigrants in London and then in Paris. Every night his Mom tells him stories. She mixes Greek mythology with Lewis Carroll, with Gulliver's Travels, with The Lion, The Witch And The Wardrobe. So a lot of anglo-saxon stories with Greek mythology and French stories as well. He sets himself this exercise that every night before he goes to sleep he's going to tell himself a premise, some arbitrary premise, and he's going to develop an entire story around that premise. You can see how this kid as he's falling asleep is mixing in the bits and pieces of stories his mother has been telling him -- she's been telling him stories rather than reading them from books -- and also inventing new stories every single night as he's falling asleep. And dreaming them as well, from his imagination. I think he's a major French cartoonist that influenced a lot of French cartoonists. I like that in the world of BD, or comics, people would define their own version of what they would do with comics. It's unique and original. It can be inspired by other cartoonists, but it's their version of it. Fred has that. All of his work is fairly consistent with this -- not just his artistic style, but his storytelling. It's as you say deconstructionist. There are things with characters going between boxes. There are a lot of things done with lettering and turning the page. More than a lot of French cartoonists he was building his pages as pages. He did a book that is a series of one-page stories, [reminiscent of] picture storytelling in the 17th, 18th and 19th centuries. He's an important cartoonist and we'll be publishing a lot of his work. I think it's very inspiring -- for the reader and for other cartoonists. SPURGEON: In addition to his being a personally meaningful cartoonist for you, you've noted that Fred is a foundational cartoonist within that tradition. One thing I remember reading about Pilote is that it was maybe slightly hipper than the other magazines. They wanted less traditional comics in there. Can you talk about Fred in an historical sense? What were people responding to at the time? In what way does he stand out in the context of those times or in the course of the medium's development? MOULY: I wasn't conscious of it at the time, but I'm not surprised to learn now that I'm older and I can google the information that Fred was one of the founders of Hara-Kiri Hebdo. He was very important in terms of the political atmosphere of 1968 -- that was a big, big deal. The U.S. had the Sixties, but France had May 1968. [laughter] It's not a whole decade; it's one month. In May 1968 my entire generation came of age. I remember May 1968 very clearly. I was 13 years old. Paris was evacuated because students took to the streets and factories were occupied. The president of the time, who was General De Gaulle, actually called in the army and circled the town with tanks. [laughs] All of Paris was evacuated except, of course, the occupied universities. My dad thought this was great fun. He was a doctor and had permission to stay. He had gas coupons. I got to stay with him. My mom and my sisters evacuated. It was replay for the French people of the exodus of the prior war. Everyone was lined up for rations because there were no supplies... it was really strange. Throughout all this it was the heyday of the student movement. That movement had cartoonists of the forefront of it, doing something called Hara-Kiri Hebdo, which was a weekly journal of cartoons. Which then got banned and came back under the name Charlie Hebdo. One of the founders was Fred. The same cartoonist who was doing the Philémon stories. He did the first 30 or 40 covers for Hari-Kari. He doesn't follow through in the later years of Hara-Kiri Hebdo. It went more to columnists. It continues to this day, actually. It still exists. It doesn't have quite the importance that it used to have. It came back to the fore when there was a controversy about the Muhammed cartoons. Not only did they go out of their way to publish the Muhammed cartoons in Charlie Hebdo, they commissioned French cartoonists to do their own Muhammed cartoons to try and get themselves killed and banned. It was totally in line with the politics of Hara-Kiri and Charlie Hebdo. SPURGEON: Is there a worry at all when you publish someone so beloved, seemingly so perfectly suited to a time, that they translate into a different context? What is Fred's unique contribution now, do you think? MOULY: That's a good question, because I think a lot of publishers feel that you can only publish something if it isn't entirely new. Everyone in the children's book world now, all they want to publish is Diary of A Wimpy Kid 3 or 4... they forget there's a time when this didn't exist. They only want to publish things that have a TV show tie-in or that kids will be comfortable with. They will pass on anything that might look old-fashioned or different. It's different for me because the only reason I'm doing books is because these are books I want to read. These are for myself or for my kids. The fact that no one else is doing it is actually an incentive for me. I feel if I don't do this, no one else will publish Fred. The kids, surprisingly enough, are not actually as reluctant to deal with things out of the ordinary as the gatekeepers think they would be. For example, we published in 2012-2013 a book called The Secret Of The Stone Frog by David Nytra. It's in black and white, a very engraved look. The kid readers didn't go, "Ew, black and white. I'm not going to read black and white," even though a lot of people said, "You can't publish something in black and white." I think the kids are much more open-minded, and in a case like Fred I'm aware that the style -- which was even old-fashioned back in the '70s. The time that Fred did Philémon, the fashion of the time was Asterix. That is more rounded, more Will Elder-type cartooning. His more '50s, more expressionistic looking thing looked a bit old-fashioned even in the '70s. What we do is when we put the Fred book together, we put in an introductory panel that introduces the character. In the back of the book -- we're just launching this line of TOON Graphics -- we also give a lot of supporting material and talk about the source of his imagination. We talk about talking donkeys, and Robinson Crusoe, and the letters of the alphabet, and unicorns and so one. You don't need to read that to read the book, but after you read the book and start thinking about it, you realize there are a lot of interesting concepts like labyrinths that entice you into further reading. That's what always happened to me. One book led to another. Each book to some extent can be a voyage of discovery. So before you start it's good if there's something familiar. SPURGEON: I was taken with the supporting material. I wondered at what point in the project's development that becomes something on which you become focused. Fred seems perfectly suited for a primer of fantasy elements, but I wonder if that was a part of the initial publishing impulse, or something that occurred to you as you worked with the material? MOULY: You're right, in the beginning it's like, "Well, that's what I love. I'll put it in English and that's that." Then I realize, "Oh my God, there's a fair amount of explaining to do." [Spurgeon laughs] "Not everybody grew up with this. Actually, nobody grew up with this. How do I share my enthusiasm?" I don't like reading prefaces and introductions, but after I've read a book, I do like looking at the discussion. I like reading reviews of a movie after I've seen the movie -- so on and so forth. I realized that was one way to deal with this. Also I've done a lot of educational material around the comics that we publish. We've been doing this forever but especially in the past year or two we've done common core guides and comics units, like a 30 lesson program for using the comics in the classroom. That's what we've been doing with the TOON comics and the TOON graphics. It is one of the pleasures when you like a book to go back into it and to be given many different ways to go back into it. One of the things we've done with the TOON books is give guides to parents on how to read comics with kids. When you're publishing for children, you have to figure out who is buying the books for the children. They don't always have a wad of cash when they walk into a bookstore. Half of the time, they find out about books in schools and in libraries. There are adults involved in making it accessible to the kids. Reassuring and educating those adults... they are often unsure -- even in this day and age -- that comics are okay for kids. They're afraid that kids will read comics instead of reading real books. They see kids' eagerness for comics. We want to show them how rich the book is. How all of the visual parts... so many readers, critics and reviewers don't realize how much information there is visually in a comic. This was one way to make this manifest so that everyone would realize that this is a book... it's something that happens with comics that you read them more than once. And reading, making the story happen in your imagination, that happens on a lot of different levels. That's not something always acknowledged in a textbook because it's less common that after you read a prose book you immediately start reading it again -- or that you read the same text book five times. It happens, but it's not common. With comics that almost always happens, especially with a comic that you like. Why? It's because the first time you get the excitement of the story and subsequent times you get more and more into how the story is told. You know what is happening, so you slow down a bit and you see all of the clever things you found in the story itself and how the artist said it. With comics, that's where you become aware of the authorship more than you would in a written book, or in a videogame, or in a movie. You enter into the creative process of making the story told, how it got from his head into your head. That's really, I think, the foundation of becoming a literate person. It's important in this day and age that kids come into the world as literate citizens. There's a lot of entertainment and diversions and appeals to their interests and attention, but books have a unique role. And especially books of comics. Comics are immutable and engraved. It's not just old-fashioned in terms of being a 20th Century medium, it doesn't morph at the touch of a button. Every time you go back to it it's the same. So if I'm reading a Philémon I read in the 1960s, it is the same. It hasn't changed. There's something quite magical about it. It's only changed in that you have changed. Your reading of it is different each time because you have evolved. SPURGEON: Were there any practical difficulties in bringing this work over? For instance, I know it's not always easy for US publishers to work with album-sized work. My guess is that this book won't fit into one of the standard TOON formats... actually, I have to admit I don't know exactly what size you're publishing this. I'm reading a PDF. My library is a mess. MOULY: [laughs] We'll send you another copy! It's important to me that you hold a book in your hands. The way we solved it was by doing a compromise. It's a little smaller than the albums that were originally published in France, and smaller than Pilote. But it's suited to library shelves. The TOON format is by 6 x 9. This is 7 and three quarters by 10. The traditional comics size is 7 by 10, the floppies, and so this isn't that much different than comics. It's comfortably reduced. It turns out that Dargaud had done an anthology of the Fred books and it had reduced very well. They are very graphic. Part of the reason why it's difficult to work with someone like Fred is that it's all hand-lettered. We were lucky that one of the people working on it at TOON really got into it. She lettered everything in English that was lettered in France. We did two or three fonts, which was worth doing for us because we want to publish more than one. We could really get into his artwork. It takes an investment in the storytelling. We have a very assiduous editor of projects. We spent all this time not doing just a translation of the book, but the emphasis in terms of what was big because of the change in language, and making it fit into the word balloons in some instances because it wouldn't fit in the exact same shape. It's months and months of production. That may deter traditional publishers because they're not visually equipped for this. They work with word documents and this couldn't be worked out as a word document. SPURGEON: Was the translation difficult? MOULY: Yes and no. Translating Art Spiegelman [into French], the level of difficulty is top notch. That level of difficulty is such that [laughs] everything else seems easy. Here, you don't have that level of difficulty. There are a couple of times when he's referring to things that an American reader would not know. The Raft of Medusa, for example. The comics that were published at the time, like Asterix, were really funny for those who were in school at the time. Having to do six or seven years or Latin, which I had to do and my parents had to do, which everybody had to do up to my generation, all of Asterix's humor was from having had endless classes of Latin, your declensions, your this and your that, all the words that end in ix. Having to read these really boring texts in Latin. It's kind of lost on modern French kids who don't do Latin anymore. It would be very hard to make it as funny for contemporary audience who don't know what Latin is, let alone Cleopatra or Alexander the Great. In Fred, The Raft Of the Medusa, it's a painting by [Théodore] Géricault that every French kid knows. So it was useful to put that in the index. SPURGEON: Were you able to work with him at all, given the length of the publishing process? He died just last year. MOULY: Yeah, he did. I met him when two years ago my husband Art was the Angouleme grand master. At Angouleme there was a show of Art's work for the whole duration and there was also a show of Fred. I was able to say, like every French person around him, "Oh, master... you so inspire me!" He was a very, very sweet person. You can see in his work that he's a very generous and warm and funny man somehow. I think it's in the work. He was very happy... he was working on the last Philémon, and there were some Canadian people putting in a bid to work on a film of Philémon. He didn't speak a word of English, but he was flattered that Art liked his work and that I liked his work. He got a lot of positive feedback before his untimely death. But no, the publication is after... he's not here to see it. I'm in touch with his son. He's very happy to see it. SPURGEON: Can you tell when you put something out if it's hitting with audiences? Do you have specific hopes for this one? MOULY: Here, I wanted to make this happen and do it right. That's why it took so long. You're right in that when we launched TOON books, a while back now -- they first came out in 2008 and we started in 2007; I laid it out as a program in 1998 -- we were specifically directing it to learn to read with comics and a specific age group. It wasn't a good time to do everything at once. Now that we have a solid foundation with the TOON Books, [we can do] the new line of TOON Graphics. This is obviously for a kid that knows how to read. This isn't easy-to-read. The TOON Graphics are not easy-to-read comics. Now we have an established set-up. I wanted to make sure it would find an audience of young people, not just collectors. That's one of the things that I think is too bad. There are so many great comics being republished these days, but often it's not finding a kids audience. It's for the collectors. The books are too expensive; they're not necessarily in a format... libraries can't buy everything. We did The Toon Treasury Of Classic Children's Comics because there's a lot of great material that exists, but it seems like two parallel tracks that seldom do meet: the collector's item, the fan, that tends to be an adult, that leaves it on his shelf, and the kids stuff. I wanted to do a book that would be alive for kids, that they wouldn't wait until they were an adult to discover. 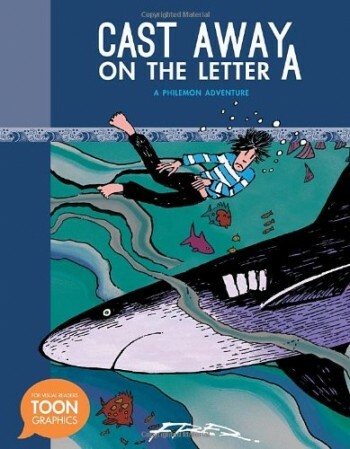 * Cast Away On The Letter A: A Philemon Adventure, Fred, TOON, hardcover, 48 pages, 9781935179634, September 2014, $16.95.